• Tuesday: cross training day! Well, it was supposed to be, anyway. I mean, it still sort of was, but I started my gym visit off with 2 miles on the tready. I felt amazing. I kept bumping up the speed. My average pace for this run was 9:51. Did the stair climber and the elliptical plus abs/core work. • Wednesday: was going to do a morning run, but it was raining most of the morning so I ended up with a night time run on the tready. I felt rather blah about running for the first almost 4 miles, then I guess I settled in and it “got better.” The last 5 minutes I increased the pace to 6.5. HA! Who needs a cool down anyway, right? 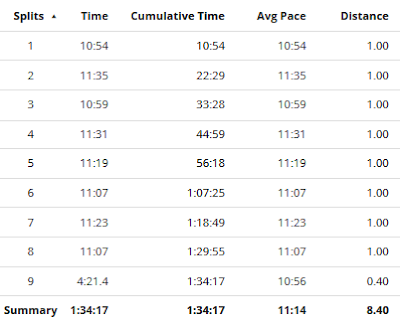 Overall average pace was 11:03. • Thursday: rest day. Spent the day at a water park with friends. • Friday: did a 4 mile tempo run on the tready. 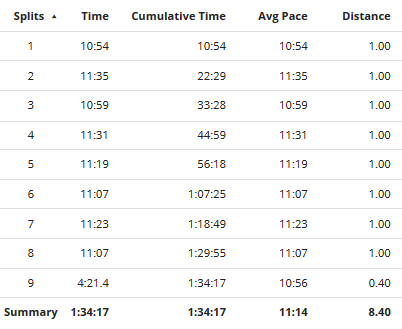 My pace was 10:00 overall. 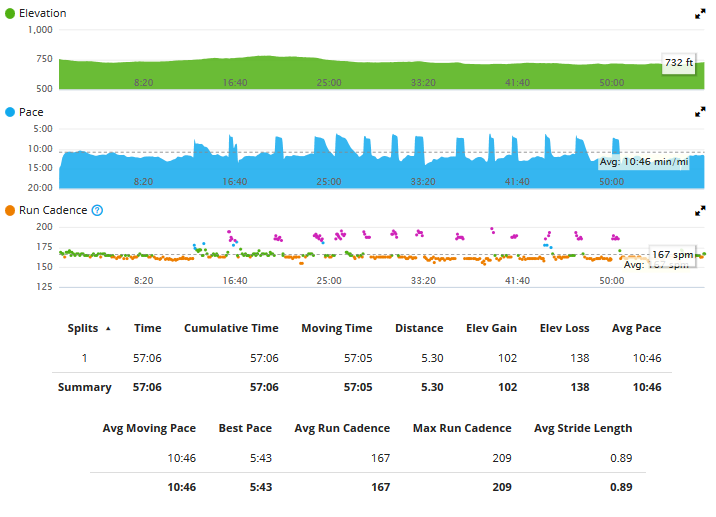 Not super fast for a tempo run, really should have been closer to 9:45…maybe? I dunno, are tempo runs supposed to be marathon goal pace? If so, then never mind, it was the perfect pace. Well, technically, 9:55 is my MGP. So, eh, close enough for this early in the game. • Saturday: cross training day. Stair climber, elliptical and swimming. • Sunday: LONG RUN DAY!!!! Sorta…haha. I have a trail half marathon this Saturday, so I am sort of in a taper. So, I just wanted to run 8 easy miles today. I ran after dark so while the start was a little humid, once I got moving, it was quite nice. 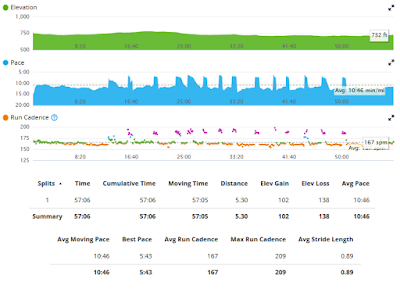 I felt really good the whole run and my pace was perfect for a long run, 11:13 min/mi. 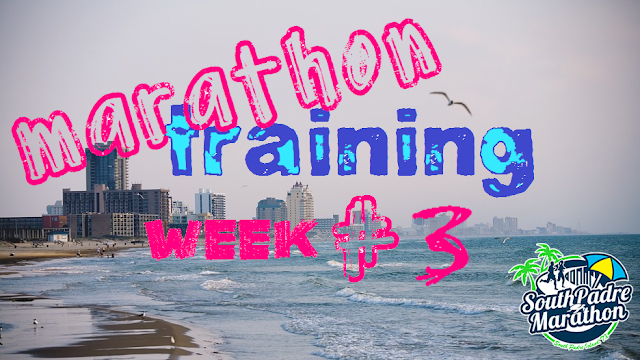 • Monday: I was going to run to and from the gym and do some strength training while I was at the gym…HOWEVER, I decided I’ve neglected my speedwork for far, far too many weeks and that I needed to do something. Plus, I received my brand new Garmin 920xt in the mail this day and wanted to take her for a spin and get to know her (her name is Jillian btw…yes, as in Jillian Michaels). I was going to do structured intervals of 1 minute fast, 2 minute recover. But, I didn’t do something right when I started Jillian and she just did regular tracking (also didn’t have my settings done completely and she only logged one really long lap, but did average out my pace by the mile, so that’s something…I think I fixed the settings to how I like them). The really cool thing about Jillian? She tracks my cadence and stride length!!! I’ll stop there as I do plan to type up a review of the 920 vs the 310 that I’ve been using for almost 2 years. Anyway, since I messed up with the intervals, I decided to do fartleks instead. If you don’t know what a fartlek is, it’s a Swedish word that literally translates to “speed play.” Basically, they’re unstructured intervals. You just run fast from point to point or run fast until you can’t anymore and have to slow down (which is what I did). I felt really good during this run. I really do love speedwork so I’m not sure why I’ve neglected it these last few weeks. Week #3 is a wrap! I certainly spent a lot of time on the treadmill. Oops. But, I mean, I know it’s a highly useful tool when weather is against you…or your propensity to procrastinate rears its ugly head and you don’t go running until mid-afternoon…and you live in central Texas…and it’s 1,000,000° outside. Whoops. I mean, I do make sure that my long runs and interval-style speedwork runs are outside at least. Last year at South Padre Island Marathon, it was a little warm, so making sure I can run long and a little fast in the heat is really a good idea to test out and perfect. So, I need to do better about doing more runs outside, AND I really need to start doing my intervals and sprints/fartleks (after school starts back up and I can no longer use the track whenever I want) once a week. They’ll do me a lot of good. I think, at least using the most common definition, tempo should be significantly faster than MP, usually more like 10k pace or half pace.